We are created in the image of a generous God. Every Christian is called to prayerfully and intentionally examine their personal finances, then dedicate a portion of their income to God's work in the world. This offering of thanksgiving strengthens our love for God and our neighbor. Generosity is a spiritual practice. Giving money away does not come to many of us naturally. We call this kind of generosity "stewardship." A church-y word, stewardship is our way of acknowledging that everything we have comes from God and ultimately belongs to God. We are not owners, but stewards, and believe we will be held accountable for the use of those resources entrusted to our care. Jesus addresses wealth more than any other topic in the gospels. He urges the rich to be generous with their possessions and relieve the suffering of the poor. Those who embrace his call to generosity experience a lightness and freedom no wealth can purchase. A one-time gift can be made by clicking the button below. You can set up a recurring donation. To do this, you must set up an online giving account in our database-Realm. If you already have a Realm account, please contact the church office. You will receive an email verification of your secure transaction. 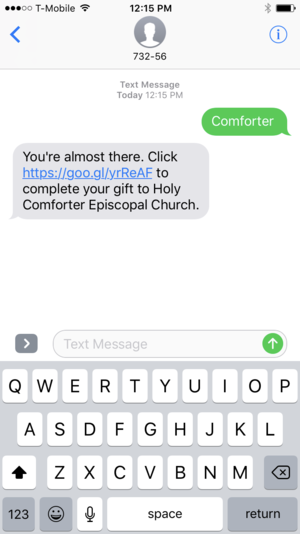 Text COMFORTER to 73256 to give using your text messaging. Standard text message rates do apply. To give to your pledge, text COMFORTER Pledge to 73256. To give to your Growing Together, text COMFORTER Capital to 73256. Cash gifts can be made by placing your gift in the offering plate or bringing it to the church office. Please remember to put your gift in an envelope with your name so we have a record of your gift. Personal checks can be made out to “Holy Comforter Church” and placed in the offering plate, brought to the church office, or placed in the mail. By selecting Holy Comforter Episcopal Church (in Broomfield, CO) before shopping on Amazon.com, 0.5% of your purchase will support God's work in our community. Holy Comforter’s Flower Guild provide altar flowers for our Sunday services. They are honored to arrange on behalf of a birthday, anniversary, wedding, baptism and more. Please fill out the form below and click here to give to Altar Flowers (suggested donation of $50-$75). Or make checks payable to: Holy Comforter Episcopal Church and enter Altar Flowers on the memo line. A gift of appreciated stock can be made by going to the Colorado Episcopal Foundation website, and clicking on ‘Individuals/Stock Gifts’. There, you can download a stock designation letter. Contact Pennie Goodman for further assistance, Pennie@coef.org. Some employers will match gifts given to charitable organizations. If your employer will match gifts and requires additional information regarding the use of your gift, please provide the form(s) with your gift or contact the church office at 303.466.2667. Holy Comforter's Legacy Ministry ensures the sustainability of our church community for future generations, through an endowment fund. Contact Gary Francis for more info.